and won't return until Friday. How about give her room a makeover? You up for coming along with me in this process? but she is outgrowing the light pink. The goal. The picture she picked out as to what she wants her room to look like. I get around to doing this. She is obsessed with candy, sugar, baking, etc. I think she will be a chef one day. Hum, this could be interesting! I did that day and show you photos along the way. OK, off to go make a giant latte before I start. Can't wait to see the results. My guest room is that same color. I have a creamy white slipcovered headboard - I really like it and I can't wait to see all the little touches you put into your daughters space! How exciting...Cant wait to see the daily updates. A girls dream come true. Thank you for sharing. Ooh! How fun! What an awesome mom you are! I can't wait to see the updates :) Have fun! Love the colors - a very grown up pallate. Good luck to you and can't wait to see up dates! She is so lucky to have such a cool mom!! Keep us updated, I can't wait to see the progress! What a fun surprise to give her when she returns! I so miss having a daughter at home.... Mine went off to college last year and is only home sporadically. But she's just met her new year's roommates and has volunteered me to help them decorate their campus apartment! Can't wait! Everyone is saying they can't wait. Exactly! Wow! Sounds like fun! Can't wait to see it! I have a son who has a Pez collection so I can't wait to see how you display them. That is going to be so fun to do, I love the pink before.....but this new room will be more grown up-ish for her. Cannot wait to go through the process with you, can't wait to see the Pez collection..cute! The cutest thing ever ...the two little beds at the end of the big bed........SWEET stuff!!! Gee I wonder where she gets her great taste? I would love that room! How fun! I hope you are going to post her reaction! It's going to be gorgeous, I'm sure. This will be a great surprise for your daughter. I like both rooms. Looking forward to seeing the pictures along the way. Ok...you got me excited!! I can't wait to see what you do as always!! 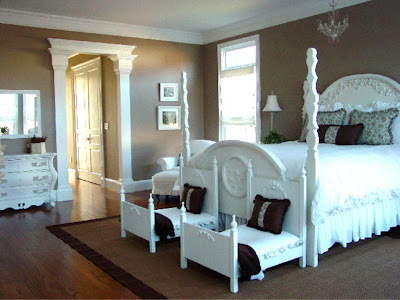 I'm gonna have to save a pic of Savannah's old room to my computer if that's ok---it was her bedroom that made me fall in love with My Sweet Savannah's style on Rate My Space so long ago! lol Can't wait to see what you get done today & you just inspired me to go ahead and paint my upstairs, why not..right?! What a great surprise for her! Can't wait to see the finished room and her reaction! The before is beautiful and has great bones! I completely understand a girls desire to have a little more grown up look though. Looking forward to seeing it in progress. So pretty! Can't to see you work your magic. How fun! I am excited to follow along with you and see you work your magic! sounds great!! what a BIG surprise!!! So exciting!!! Can't wait to see what you do!!!! I will love to see what you do with the pez collection!! my son has the same collection and i have no idea as to what to do with it! what a great mom you are, she will love the surprise!! have fun! How fun!! can't wait to see how it turns out! Can't wait to see it. I love to suprise my kids with things like this. I ran out of time when my son was at scout camp, too much procrastination. I did get it done while he was at church camp. I have to find time when my youngest is away to do hers. I was too mopey when she was gone to camp this last time. Umm can you fly to Phx and come decorate my nursery and my master bedroom! Your home looks stunning her bedroom belongs in a magazine!! Can't wait to see the final outcome. She has such good taste. Must get it from her mom :) I look forward to seeing how it all turns out. Have a great time. The current room is adorable, but her inspiration pic is beautiful too. Can't wait to see it! Beautiful rooms. Can't wait to see what you do and how you will incorporate those Pez's. Have fun! Waiting to see each result, with great anticipation. Thanks for sharing such wonderful inspiration! Oh so fun! Thanks so much for taking us along for the fun ride. Can't wait to see your progress! How was your day at the BH? I bet amazing! Cant wait.... I will check all night to see if you have posted anything... always enjoy your blog and of course all your great ideas and work! Melaine, This has nothing to do with your daughter's room, but I just had to say, "Thank you!" I am repainting my living room the Ralph Lauren oatmeal color you have in your home. Only one wall is half-way painted and I am LOVING it!! Can't wait to see it all come together. We just moved our youngest into big sister's old room. Still adding the finishing touches. Now big sis needs a new room, for the occassional visits. I am loving those colors! What a heavenly bedroom...both of them!! What a wonderful mama you are :) Can't wait to follow this journey yay! I can't wait to see the transformation - and let me know if you have any "pink" stuff you are ready to get rid of, my little Fia is a PINK girl! I love doing things like this...I ALWAYS decorate their rooms without letting the kids see it...makes it so much more FUN! Excited to see your "after" the "before" is beautiful already! Love the after but the before is pretty darned cute too. Can't wait to see the progress. My kiddos are at camp this week too. OOOooooo, this is going to be such fun!!! Can't wait, love te inspiration picture!